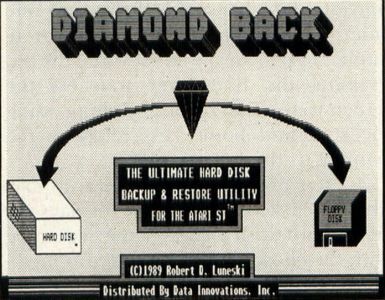 Hard-drive owners still searching for a hard-drive back-up program that suits their needs might want to consider Data Innovation's new Diamond Back. The software works with any ST, no matter what the memory or hardware configuration, and claims to be the fastest and most powerful back-up software currently on the market. Diamond Back allows the back-up of not only entire partitions, but also individual subdirectories. The usual back-up options—file compression, file encryption, incremental back-up and a write-verify toggle—are available. 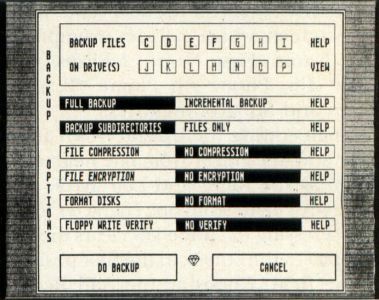 Also included in the program is a complete restore utility that allows a hard drive to be restored from the floppy disks automatically, including the ability to restore files to a different pathname than the one from which they were backed up. Diamond Back retails for $39.95. CIRCLE #111 ON READER SERVICE CARD.